The award-winning Clive Daniel Hospitality division of Clive Daniel Home recently completed the first phase of a two-year, $30 million interior design renovation of the Quail West Golf & Country Club in North Naples, Florida. The two-phase enhancement initiative was designed to meet the needs of Quail West’s growing membership and changing lifestyle characteristics of the community’s members. Nancy Woodhouse IDS, Clive Daniel Home’s VP Hospitality and Business Development, has guided the interior design of the clubhouse in a cooperative effort with Dave Humphrey, Architect. The first phase of the 70,000-square-foot Mediterranean-inspired architecture clubhouse features a new 12,000-square-foot dedicated fitness and wellness building. Enlarged and redesigned pre-function spaces overlook the indoor glass-enclosed pool with a completely new lighted bar with a contemporary glass wall. 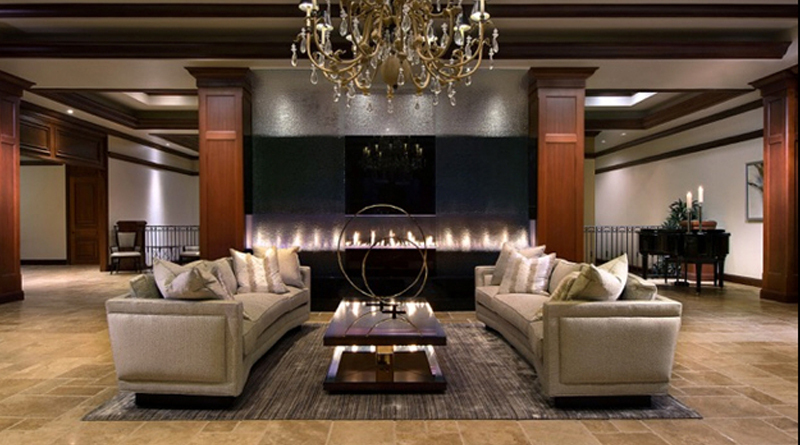 A double-sided fireplace warms the room and allows seating venues for casual conversation in both the gathering room and the adjacent clubroom. The expansion of the second floor kitchen has enhanced service to both the Mahogany Room formal dining room and to events including 300 to 350 people in the adjacent ballroom. Work on the redesign of the main lobby entrance has also been completed. Exquisite furnishings are framed by a new fire and water feature in the lobby that creates a memorable impression on members and guests as they enter the exclusive Quail West venue. The design team is currently in the process of implementing plans for Phase II –scheduled for completion in fall 2017– which will transform the lower floor of the clubhouse, providing a more relaxed casual atmosphere to tie in traditional elements of the club. The two-story dedicated fitness and wellness center building being built by Gates Construction will be completed this spring and will feature the latest in equipment with a more contemporary design direction and furniture styles. This upscale building will have impact areas like a stack-stone wall in a glass incased two-story open staircase. Their design concept is intended to enhance the club’s high-end finishes while incorporating new design elements consistent with the new building additions. The upper floor of the clubhouse has remained more formal with a transitional feel. Clive Daniel Hospitality is the commercial interior design division of Clive Daniel Home, staffed by seasoned design professionals specializing in hospitality and commercial projects across the country. Clive Daniel Home interior designers have also completed interiors for multiple Quail West and Stock Development model homes. For additional information, contact Nancy Woodhouse at 239-287-1739.